Once again, Alyson Noel delivers in fine form, a riveting, enchanting and addictive novel. The writing is beautiful and the storyline is never dull. That is what is so great about her as an author, it's never what you expect, there is always an exciting twist to keep you guessing. This book is another 'can't put down' and leaves you desperate to find out the fate of both Ever and Damen, as they struggle to be together. I also like that Ever's character is so resilient, she's been through a lot of torment in the books, but she is determined to keep fighting. This is an excellent sequel to an already high standard of books. It continues the story well and sets the pace for the next instalment. Wonderfully written and powerful, highly recommended to existing Immortals fans and new fans alike - this is one series you won't want to put down! I am not gonna be a jerk and spoil alert this for anyone, but I just cant seem to but these books down...I read this book in two days it was so addicting, and I am almost done with the 5th one in the series as well. 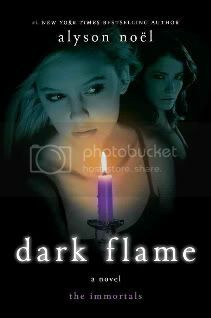 I have read "Dark Flame" by Alyson Noel in one and a half day. It was beautifully written and I could not put it down 7dollaressay website review. The Immortal series is not the best series I've read, but when you read the first book then the second and third and so on you want to know what happens next.